SINGAPORE (Jan 17): Most Asian currencies rose on Tuesday, in a move that traders said was likely driven by position squaring ahead of a series of potentially market-moving events over the next several days. The South Korean won rose 0.7% and the Singapore dollar gained 0.6%, leading the gains among emerging Asian currencies. The immediate focus is British Prime Minister Theresa May's speech later on Tuesday, and how it might affect broader risk sentiment, traders said. "If risk aversion makes sterling fall...then I think dollar/Asia will go a bit higher," said a trader for a Malaysian bank in Kuala Lumpur. The dollar's softer tone on Tuesday seems to be mainly due to position adjustment among market participants, he added. May will say Britain will not seek a Brexit deal that leaves it "half in, half out" of the European Union, according to her office, in a speech setting out her 12 priorities for upcoming divorce talks with the bloc. Those priorities will include leaving the EU's single market and regaining full control of Britain's borders, several newspapers have reported, reinforcing investor fears of a "Hard Brexit" which have pummelled the pound. Investors are also looking to speeches by U.S. Federal Reserve officials this week and Republican Donald Trump's inauguration as U.S. President on Jan 20, for near-term catalysts on the dollar and Asian currencies. 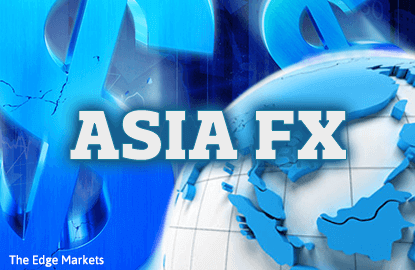 Stephen Innes, senior trader for FX broker OANDA in Singapore, said the dollar's broadly weaker tone on Tuesday was probably driven by position adjustments. "If you look at this long dollar trade, which is still on the books, it hasn't been cleared out," Innes said. Asian currencies have risen broadly so far in January, with some of those gains coming after a news conference by Trump last week offered little clarity on his fiscal policies and disappointed dollar bulls. Analysts at Citi said they would expect the Singapore dollar to outperform in any bouts of U.S. dollar weakness. "In Asia, our FX flows data suggest that real money investors' extreme short SGD position could be another casualty of the ongoing position squeeze, or if conviction in the long USD view softens even temporarily," they wrote in a research note. "Additionally, our positioning indicators also suggest that KRW shorts may be similarly vulnerable," they added. A Reuters survey published last week showed that market sentiment toward most Asian currencies became less pessimistic over the past month. The poll showed, however, that bearish positions in the South Korean won and the Singapore dollar were somewhat larger, compared with the positioning in other Asian currencies.